Expanding on last week’s story on why there is no Red Line station at the Hollywood Bowl, the Metro Library continues its look at transit access to one of Los Angeles’ premier entertainment venues. After plans proved a subway stop to be too challenging in terms of engineering, financing and ridership projections, the focus shifted to linking the Bowl to the Hollywood Highland Station via a connector. 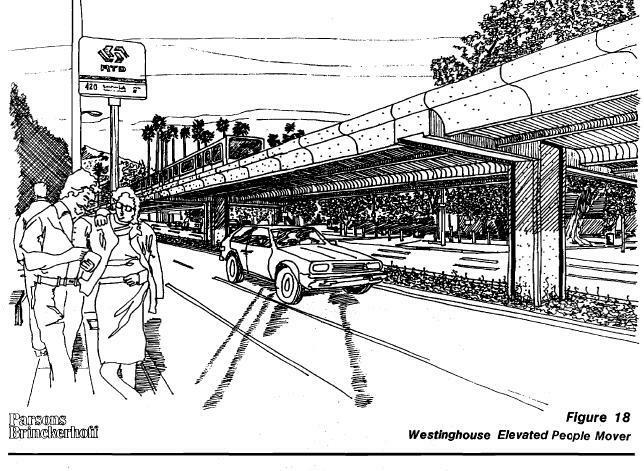 Take a look at the six different alternatives considered for underground and elevated moving walkways and people movers over at the Library’s Primary Resources blog. An interesting side note are the “pocket track” remnants on Highland avenue. Back in the day when a streetcar ran up Highland and onto the median of the Hollywood freeway, there were dedicated rails or pocket tracks to hold streetcars for the crush of people after a performance let out. The area is now used to hold buses in a very similar configuration, but if a Hollywood streetcar were ever to be introduced it would be interesting to consider re-introducing such a thing. Perhaps the folks looking at re-introducing a downtown streetcar might ponder such an idea. Interesting, although I am curious as to why the linked article never seems to mention why any of those ideas still have yet to be implemented. Was it NIMBYism? cost supposedly outweighing the benefit? Contract issues?